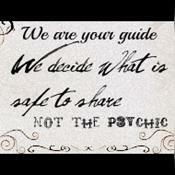 If you seek THE TRUTH and expect RELIABILITY and an EXPERIENCED PSYCHIC then look no further! I have a natural psychic gift. Please have a pen and paper handy! My ability was seen as young as 6 when I named the hospital and state where I would have my first child that later proved correct. This ability came from a family who recognized psychic gifts that can be traced to my grandmother and great Aunt. Omens and dream interpretation was common growing up. ~If you enjoyed your reading, please rate. TY~Always have a question. Some clients say 'tell me anything you get' but I found most everytime they are angry I did not hit on what they considered important (this means they do have a question) because what the guides find important for your spiritual growth and lessons of life may be entirely different. You don't see a doctor and tell them to 'guess' where I am ailing and then tell them they were wrong. If you tell a doctor where it hurts but he diagnosis you with something in an entirely different area of your body you don't tell them it isn't important, what you say hurts is important. It may be that neglecting one area is leading pain to another area of your body or the pain you feel is minor and will heal on it' own but something else is more pressing to heal you are completely unaware of. Miranda Tempest has been a user of Keen since 2003. Getting Life Questions advice from Miranda Tempest through www.keen.com is safe, secure and confidential.